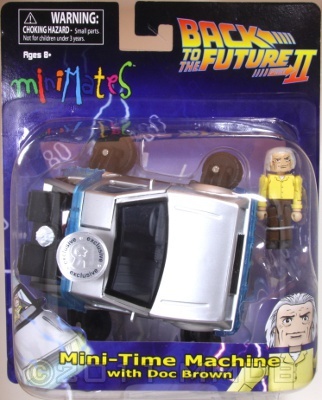 Doc Brown MINIMATE fits inside vehicle for time traveling excitement! Prepare for the adventure of a lifetime, because once you reach the 88 MPH Temporal Displacement Threshold there's no turning back! This Minimates sized Time Machine replica recreates the iconic vehicle responsible for turning Doc Emmett Brown and Marty McFly's worlds upside down. Buckle your seatbelts, fire up your Flux Capacitors and discover what it really means to go back to the future again, with this hover time machine from the hit sequel. Featuring the modifications Doc Brown did on his trip to the future, folded up wheels for hover action and a Mr. Fusion for much safer travel than plutonium power.